Are you caring, curious, and resourceful? Are you passionate about working with children and making a positive impact on the lives of others? 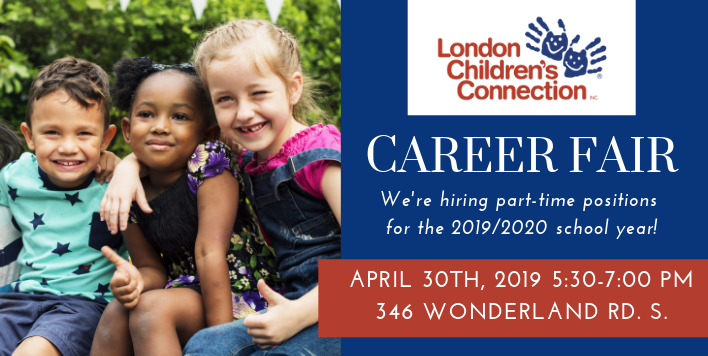 As an educator with London Children’s Connection you will play an extremely important role in supporting the growth and development of children in your community. We are hiring currently for the 2019/2020 school year, beginning September 2019, and there is no time like the present to get to know us and learn how we can be a part of your professional growth. Positions include: Program Supervisors, Program Assistants, Child Care Assistants, and Supply Staff. Qualified candidates will have previous professional experience working with groups of children and have an Early Childhood Education Diploma OR post-secondary education/training in a child and family related field. We hope you’ll join us, and don’t forget to let your friends know about the Career Fair on Facebook! Enjoy a rewarding career, working with children and families! We offer valuable employment opportunities in programs located throughout the city and in Middlesex County. The majority of our programs are located in elementary schools.